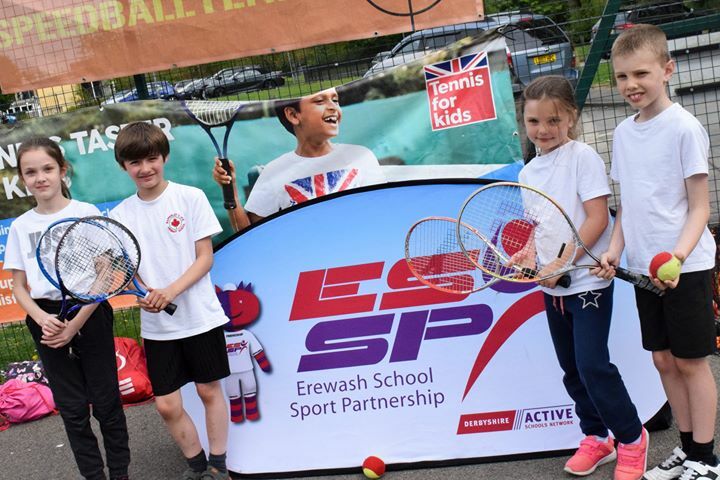 It was game, set and match for primary pupils who took part in a tennis tournament organised by Erewash School Sport Partnership. Two preliminary events were held and Sawley Junior, Firfield Primary, Chaucer Junior and Hallam Fields went through to the final where Sawley were crowned the champions. Other schools which took part in the events included Ashbrook Junior, Hallam Fields, Mapperley Primary, Shardlow Primary, Brooklands Primary, Sawley Junior and Firfield Primary. All of the events were run by Mark Towers from Speedball Tennis in Long Eaton who showed the pupils some basic tennis moves before they played a series of matches. Mark said it was great to see so many young people keen to try tennis. Rhian Lilley, Erewash School Sport Partnership development manager, said she hoped that the events had inspired the pupils involved. She said: “It’s not long now until Wimbledon starts and hopefully events like this will encourage children to give tennis a go. Mark is a fantastic coach and gave them some great advice and tips. Notes to editors: Erewash School Sport Partnership is a group of 45 schools working together to develop PE and sport opportunities for all young people. Its core priority is to improve the quality and quantity of PE and sport in schools. The partnerships aims to engage, motivate and include as many young people as possible in a positive PE and sport experience.